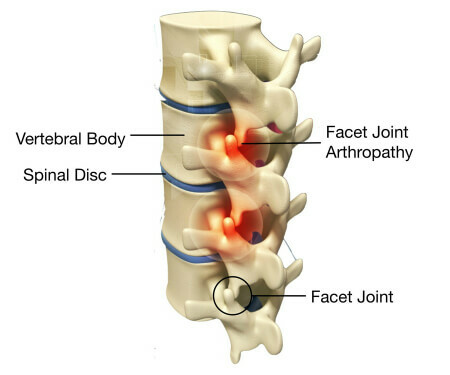 Facet joint disorders are some of the most common of all the recurrent, disabling low back and neck problems, and can cause serious symptoms and disability for patients. 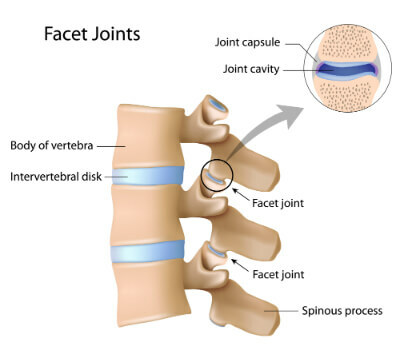 Facet joints (zygapophyseal joints) are the small flat vertical joints found on the rear or posterior area of the spinal vertebra that align themselves with facets of adjacent vertebra. The joining of facets from two adjacent vertebra stabilizes and assists limited movement of the spinal bones. Facet joints are found at all levels of the spine, supporting and bracing the spine while allowing free movement. The facet joints are located at the upper and lower portion of each vertebra of the spinal column’ there are two facet joints at the upper portion and two at the lower portion of each spinal bone. This arrangement of the two facets meeting is much like when placing the two open hands together in prayer so that the palms face each other; one palm is placed against the surface of another palm to form a unit. In the spine these facets form similar paired units that link and lock the spinal bones together while still allowing movement when the facets slide across each other. Facet osteoarthropathy is just another way of saying osteoarthritis of the facet joint. Facet osteoarthritis is the common form of degenerative arthritis that occurs as we age, causing a breakdown of the cartilage between the facet joints of the spine. Facet osteoarthritis is the result of spinal arthritis and joint effusion eventually developing into facet osteoarthritis. The pain of facet osteoarthritis tends to be minimal to moderate during the early hours of the day when the buildup of fluid (effusion) in the joints is lowest. However, as the day progresses and continued stress is applied to the facet joints during normal daily activities of living the pain tends to increase. The pain tends to be localized near the areas of joint involvement near the midline of the body, causing a small or large area of the neck or low back to be painful. Pain that is often worse in the beginning and end of the day or with a change in weather. 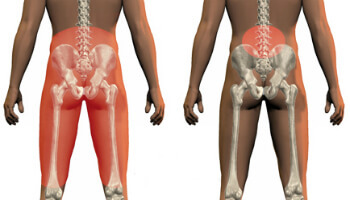 Lower back pain that radiates into the buttocks, pelvic area, or thighs. Neck pain that radiates into the shoulders, arms, or head. Headaches at the base of the skull, aching behind the eyes, and/or ringing in the ears. The sound of bone rubbing on bone when you move. Abnormal curvature in the spine. Weakness or numbness in your legs or arms. Standing has some effect on facet joint pain. Sitting or riding in the car for long periods of time can also significantly exacerbate the condition. Proper diagnosis starts with an experienced doctor. The type of pain that you may have with facet syndrome can be similar to the symptoms of several types of disorders. Accurately determining the correct source of your pain is critical to successful treatment. Begins with a thorough clinical evaluation. Including a complete medical history, analysis of your symptoms, and physical examination. Testing may include x-rays, MRI and/or CT scans, and electro-diagnosis (EMG). Physical therapy/exercise to strengthen the spine’s supporting muscles. Acupuncture is a safe medical treatment that involves inserting ultra-fine needles at specific points on the skin. Transcutaneous Electrical Nerve Stimulation (TENS). This type of non-invasive therapy uses small amounts of electricity to reduce sensitivity of nerves around the spine. Patients typically feel only a gentle vibration or tingling during TENS treatment. A diet filled with a variety of fresh fruits and vegetables, beans and peas, nuts and seeds, whole grains, lean meats, and especially cold-water, wild-caught fish is sure to provide you with all the nutrients that are important in maintaining overall health and flexible, healthy joints. Also add ginger.